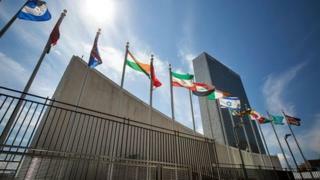 The United Nations - often called the UN - is a worldwide organisation, that brings countries together to talk about, and try to agree on, world issues. It was set up in 1945 after the Second World War as a way of bringing people together and to avoid war. 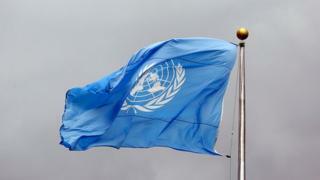 Because of this the United Nations logo shows the world held in the 'olive branches of peace'. When the UN was formed, 51 countries became members from all corners of the world. European countries including the UK, France and the Netherlands joined alongside Australia and New Zealand, the United States and Canada, South American countries like Brazil, Argentina, and Mexico, as well as Cuba, India, Saudi Arabia, Syria, and Turkey. It's been gradually growing ever since, and is now made up of 193 countries. South Sudan was the most recent country to join, in 2011. 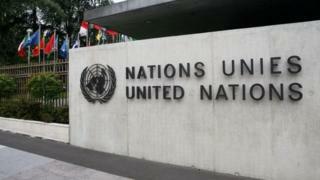 The UN provides different countries with a place to discuss issues and give their views on world issues. 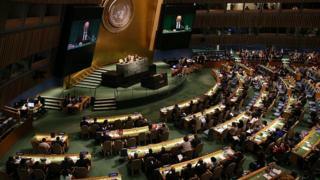 A huge meeting called the General Assembly is the UN's main place for debate. There is a special document called a charter which sets out the areas the UN can take action on. This sets out four main purposes: keeping worldwide peace and security, bringing countries closer together, helping them to solve international problems, and helping them to meet common goals. Each country can send someone called a delegate, who will speak on that country's behalf in discussions and meetings. Each member country has one vote. Decisions that are voted for become resolutions. But while the assembly can make recommendations based on what is said, it can't force the countries to take action. The Assembly's decisions are not laws, and governments follow resolutions because they represent the world's opinion on major international issues. What kind of things does the UN care about? The UN is interested in areas that affect people's lives - for example climate change, food production, human rights, gender equality, peace and security, disarmament, terrorism, and health emergencies. Some of these are considered to be so important for the UN that they have set up special smaller committees just to talk about this topic. 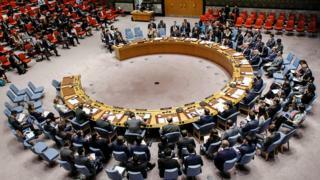 One example of this is the UN Security Council, which can introduce penalties against countries or even authorize the use of force to keep peace and security. 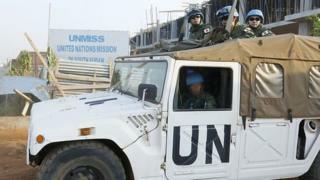 The UN has sometimes brought 'peacekeepers' into countries affected by conflict. This is a group made up of soldiers, military and police officers and civilians from different countries around the world who will come to try and help the country stay peaceful. 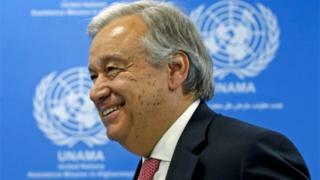 António Guterres is currently the head of the UN, in a role called the General Secretary. He's been in charge since January 2017, and is former Prime Minister of Portugal. Before this the General Secretary was former South Korean foreign minister Ban Ki-moon, who stepped down at the end of 2016. The United Nations headquarters are in one of the busiest parts of New York City in America. But the land and buildings do not belong to the USA. The UN buildings are international territory. This means that they belong to every country that is part of the UN. What is the UN Convention on Rights of the Child?